First thoughts are…we love it!!! Second thoughts…still love it!!! The overall look and feel is spot on. Resource On Demand have been successfully placing individuals in cloud technology jobs since 2007. And, is proud to be considered the leading provider of cloud technology, digital marketing, Human Capital Management (HCM) and Salesforce recruitment solutions across the UK and Europe. 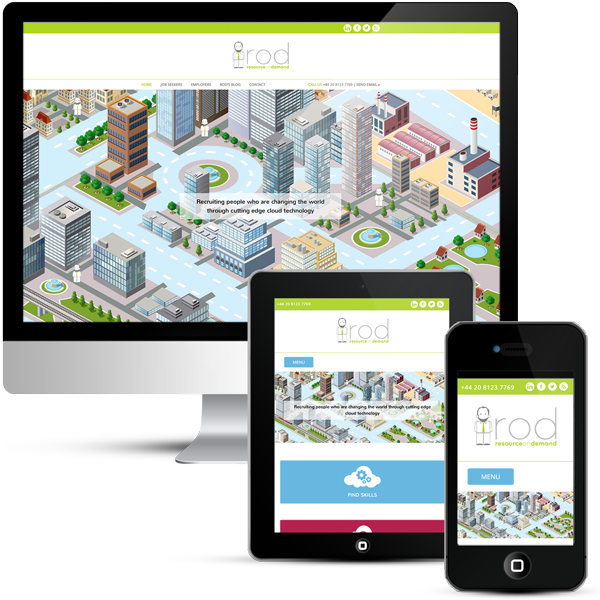 Over the years ROD have helped companies of all sizes to grow their teams of cloud technology and SaaS experts. Companies such as; technology and cloud start-ups, global end users, tier 1 consulting companies, boutique consulting partners, not-for-profit organisations and Independent Software Vendors (ISVs). Recruitment company website design is a specialist subject as they require functionality for job listings and job search. This involves ensuring that there are the required number of categories attached to the job listings to enable a meaningful search. It is important to know the exact criteria that you want to match before you start. So choices might be area, salary, job type and contract type. Search results and job listings need to be laid out well, so it is easy for potential candidates to easily identify the roles they want to view in more detail. 74% of job seekers use their mobile device to search for jobs once a week or more. Mobile devices now account for one fifth of global web traffic and growing. It is essential that recruitment companies have a mobile friendly website design – this helps keep visitors on the website longer, leading to more candidate registrations, more client enquiries and less traffic lost to the competition. I loved creating this unique isometric drawing for the website, which includes the little ROD man graphic. It reminds me of one of those puzzle books when I was a child when you had to find all of the objects in a picture.